Spring-clip. With the tassel for field officer, Overall length: 100.1�p. A scabbard is the blue brown of a purple tendency. Metal fittings have applied the transparent protective coating material. Yasukuni Jinja was founded in order to deify the people who were killed in the battle of the Meiji Restoration by Emperor Meiji's will in 1869. Therefore, the crest of Yasukuni Jinja obtains the 16 petal chrysanthemum crest of the Imperial Household's family crest. 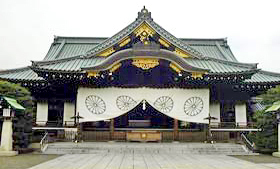 In the beginning, although called "Tōkyō Syōkon-sha", the name will be changed to Yasukuni Jinja in 1879 (Meiji 12), and it will continue till today. The shrine name of "Yasukuni" was named by Emperor Meiji. "Yasukuni" is a meaning showing the wish of "making a country peaceful." Yasukuni Jinja will deify the people who died in order to protect a Japanese country in war with a foreign country after Southwestern Rebellion in 1877 (Meiji 10). Yasukuni Jinja has deified the soul of 2,470,000 or more soldiers who sacrificed themselves to the country since Meiji. Wartime period, many soldiers left the family the will of "Come to meet Yasukuni Jinja" and went to war. Although Yasukuni Jinja was a big special government shrine prewar days, after World War II became a religious corporation. 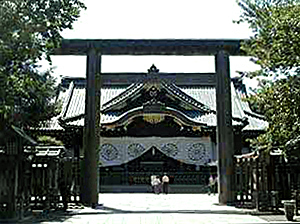 In order to respond to revival of a Japanese sword, and the demand of the Guntōes for officers based on a private sector charitable person's fund in 1933, the sword community and the army cooperated and "Japanese Sword Forging Association " was established in the precincts of a temple of Yasukuni Jinja. Although "Tatara" of the ironing method peculiar to Japan had stopped by the "prohibition law of the sword" of Meiji, "Yasukuni-Tatara" started operation. Japanese Sword Forging Association did the sword making of the good Japanese sword, and supplied the army officer. Japanese Sword Forging Association's swordsmith was able to give the swordsmith name from the army. The first character of the swordsmith name had become the rule which certainly attaches the character of "Yasu" of Yasu-kuni. About 8,100 Japanese swords were made to the end of the war. Those days, this sword was called a "Kudan-tō." 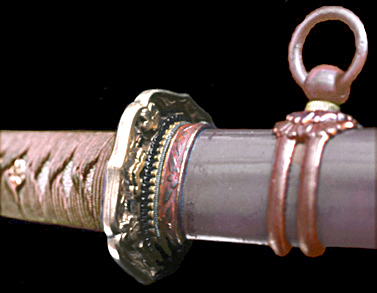 After the war, this sword came to be widely known with Mr. Tom Kishida's work "Yasukuni-tō." Blrown gloss coating. A mallow-shaped openwork guard, Spring-clip. With the tassel for field officer, Overall length: 100.3�p. A Knot loop is 2 color finish. A rayskin is a large grain with the Oyatsubu. Inscribed Jpanese 2 Kanji characters "YASUKUNI" on the blade collar(Habaki). Real name: Shigeo Abe (Yamagata native). He receives the Mei of "Yasushige" on October 4, 1939.
administration headquarters-sponsored second army Guntō exhibition.